Google has today announced that it is launching snippets on its Google Maps product, allowing you to easily share directions or places with their Google+ Circles. The +snippets feature will act very much like it does elsewhere in the product lineup. To share a +snippet, simply click the ‘Share…’ button in the Google+ bar at the top of the screen and whatever you’re seeing on maps will drop into a share box that allows you to publish it to Google+. Adding snippets+ to all of its products is obviously in the cards, but the addition to Maps brings some especially cool utility. Because the Share button automatically parses the content on the page, there is no cutting and pasting of addresses or URLs, which is great. It also means that, as long as they use Google+, you can pop out a temporary Circle with just the specific people you’re traveling with and share directions, a place or maps with them specifically. This is a very nifty way to coordinate travel plans. Even if the users aren’t on G+, you can still publish it to your profile and share it via a link. 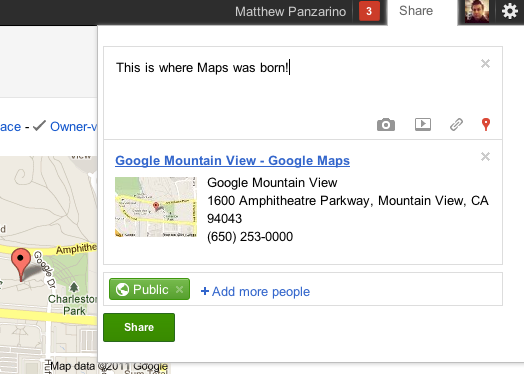 Maps is only the latest Google product to get +snippets, as Books, Offers and Product Search also have the feature.